Good news. 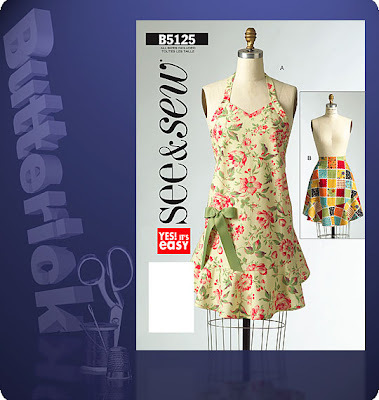 I was at Joanne Fabrics the other day and noticed that they have made a see n' sew version of the apron pattern we are working on this month - B5125. After closer inspection I realized that it is exactly the same - with only two apron options instead of four. So if you missed the sale you can always get the pattern for $2.99. So now there are no excuses to not whip up one of these cute aprons. Don't forget to enter our giveaway. Click here for the giveaway post. Gotta tell you all, I love this pattern. I made it reversible for a friend of mine, not to difficult to adapt, and she absolutely loves it. I think I like the v-neck and the way the straps come up the sides best. And I had to piece my flounce, too.